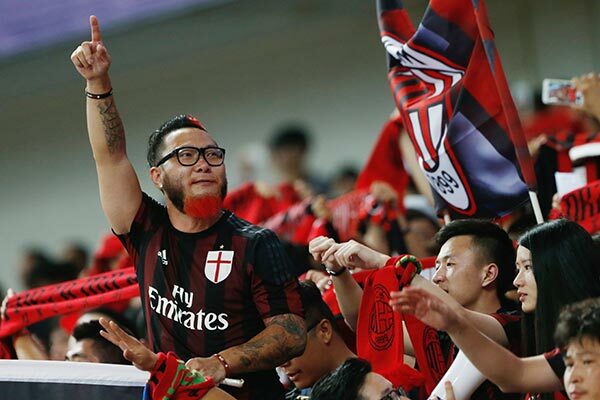 A group of Chinese investors agreed to take an initial stake of 70 percent of Italian Serie A soccer club AC Milan, with discussions continuing on the sale of the remaining 30 percent, a person familiar with the negotiations told China Daily. Former Italian prime minister Silvio Berlusconi, whose Fininvest investment group owns the club, will remain president for the next two or three years until the additional 30 percent is acquired by the Chinese. That part of the deal is still under discussion, the person said. "A possible clause, for the remaining 30 percent to be bought by the Chinese consortium is still under discussion. The ultimate decision will be made by Berlusconi," he said. "If everything goes as planned, a final agreement will be reached by June 15-20, subject to any changes," he added. The Italian side have asked the Chinese consortium to reveal "exactly who will be buying and how many of them are there." The Italians are also seeking a list of consortium members and the percentage that each member intends to buy. The exact amount has not yet been disclosed but Italian press reports have in the last few days talked of a price of 700 million euros for the whole club. Fininvest's board of directors met today but the main purpose was to review the company's annual report. Italian media reports said talks in China between Suning Group and officials from Inter Milan, AC Millan's great rivals, have been positive but no other details of the rumoured takeover bid were available.